Foam packing peanuts have protected our shipped items since the seventies, but scientists are only now realizing their impact on the environment. That’s because these protectors of all things fragile are often made from polystyrene (plastic #6), a resin that does not biodegrade, is resistant to photolysis, and has become a chief component in the great pacific garbage patch. There’s good news: If you receive foam peanuts this holiday season, you can drop them off for reuse at a shipping place instead of throwing them into your garbage! 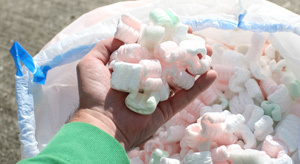 When you receive a package stuffed with foam peanuts, save them in a box, bag, or basket near your other recycling. Once you have a big enough pile, or actually have something to ship, take them with you to the nearest packing place for reuse. Michael from Mail & More at Belle Hall Station told me that as long as the peanuts are clean, dry, and are not mixed with other trash, most packing places would love to have them back.